When people find out that I plan our meals every week, they sometimes don't believe me. I get a look of disbelief and/or a delayed question such as, "wait, you really plan out your meals each week and then you actually cook them?" Yes, I do. I'm a planner and I enjoy cooking and eating. It works. There are a number of factors that influence my decision regarding our meals for the week. Schedule: What is your schedule for the week? Which nights do you need to plan a meal? Most Sundays we have dinner at my parents' house so that night is one we never have to worry about. Time: How long do prospective meals take to prep and cook? Something time intensive, like this Beer Braised Irish Stew, is a good option for a day when you know that you will be home -- not so good for the day when you aren't home until after 6:00 p.m. and want to eat before 8:00 p.m. Slow cooker recipes are great for during the week IF they don't require a lot of prep time. I don't know about you but I'm already not that quick at 6:30 in the morning. I don't need any added level of difficulty. Leftovers: Bringing lunches to work during the week is both less expensive and healthier. For meals that we cook on a weeknight, my honey and I look for dishes that serve 4 - 6 -- usually the perfect amount for dinner and leftovers for lunch the next day. In addition to the amount, I also lean towards dishes that I know will taste good leftover. For example, the Slow Cooker Chicken Chili is just as good, if not better, leftover. Weather: Yes, weather. Certain dishes are great when it is cold out -- stew/soup type dishes, for example, warm up your kitchen just as much as they warm up your belly. On the flip side, when it is warm out, opt for no or low-cook dishes. Variety: Try to keep things interesting -- a mix of different types of foods, such as pasta, vegetarian, Mexican, etc. I also try to find a balance between our favorites, like this Taco Salad, and new recipes I have been wanting to try, like this Avocado Pasta. Pick a day each week for meal planning and grocery shopping. Depending on our schedules we do the planning and shopping on either Friday, Saturday, or Sunday. Make a list. I make our list based on where things are in the store. It makes the shopping trip go much faster. Shop early morning or late night. Go grocery shopping either first thing in the morning or after dinner. It will be much more likely to have the store (and staff) to yourself. Post your menu. One of the other things that helps us, especially when we are having a particularly busy week, is to have our meals for the week posted in our kitchen. 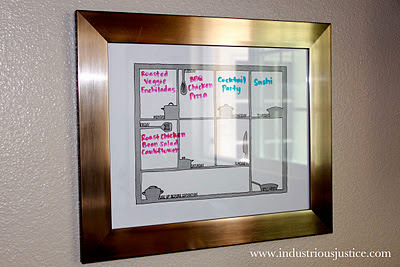 You may remember that I made this weekly dry erase menu planner. We have it hanging over our kitchen sink. 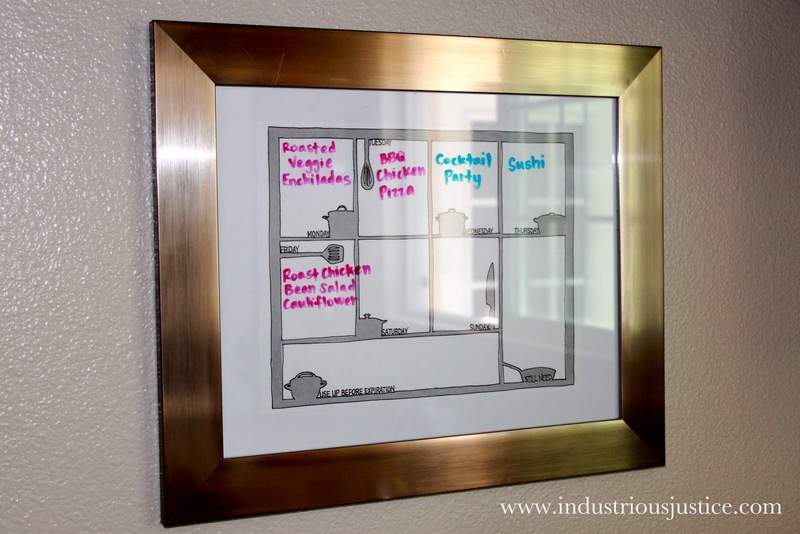 The thing is, you don't need a fancy shmancy menu planner. A piece of paper hung on your fridge will do just fine. Or print out a template from online. My love of planning is not to say that we are inflexible. For example, this week I postponed our Slow Cooker Beef Fajitas from Wednesday to today because we ended up with more leftovers than we anticipated from a delicious Asian Slaw with Ginger-Peanut dressing that we made for dinner on Tuesday. Recipes for both of these to come! It was SO good and plenty filling as a vegetarian dish (although also good with chicken). I will try to post it this week. This is almost exactly what I do. In the long run its actually easier to plan out your meals, no coming home and saying "whats for dinner" I think its worth a little extra time to plan ahead, and save yourself a lot of time later, running to the store, or standing in front of the fridge..